I've decided to dedicate a small corner of my website to the adventures of my new son and growing family. Partially for my future self to have images and memories captured to look back on and partially as an outlet for my feelings, thoughts, and wonderings. I hope you enjoy hearing about our journey, the ups, the downs and the in-betweens. I debated writing about Jack's birth. Everyone's birth story is different and reading Jack's may trigger you. I am sharing some details that were very scary for me during the labour and delivery and just want to warn anyone in advance. I debated how much of his life I should share online. Being a photographer, my natural inclination is to document and share all of life's experiences. But when they are yours and very raw and real, it's sometimes hard to step back and acknowledge when it is time to capture a moment. I have to decide when to photograph a unique moment of my son's life that may not convey the emotions we felt at the time simply through story telling. Jack had an arrhythmia present during most of my pregnancy. Undetected on ultrasounds for some reason, but detected on non-stress tests and dopplers. We had additional ultrasounds throughout my pregnancy to simply monitor the arrhythmia. During one non-stress test, a high heart rate was present for a short period of time. His heart rate was above 220 beats per minute for less than a minute. A normal fetal heart rate range is approximately 120-160 beats per minute. We weren't overly concerned as it seemed to be an intermittent and typically something babies "grow out of". I learned quickly that Jack would be deciding how he wanted to come into this world. 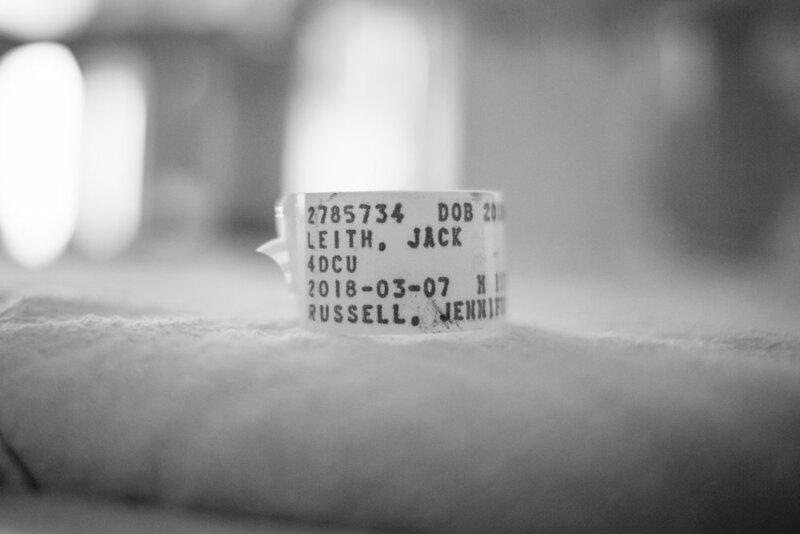 I am not going to go into every detail about how we ended up where we ended up, but I will share that up until the last hour before Jack arrived, things were positive, upbeat and I was looking forward to how I thought Jack was going to arrive into this world. Everything changed very quickly when the presence of meconium (baby's first poop) was found. The risk with meconium is that baby can inhale it and suffocate in the womb. I was quickly taken to the operating room for an emergency caesarian. Jack was delivered and taken to be assessed immediately. Dave wasn't allowed to go meet his son for quite some time, which started to worry me. In addition to the fact we hadn't heard Jack cry yet. It was 4 minutes before we heard Jack. Those were the longest 4 minutes of my life. He had to be intubated twice to remove all the meconium he had inhaled. We spent some time with Jack and were then taken to the recovery room. I had Jack on my chest and was connecting with my new son, it was one of the most incredible moments of my life. 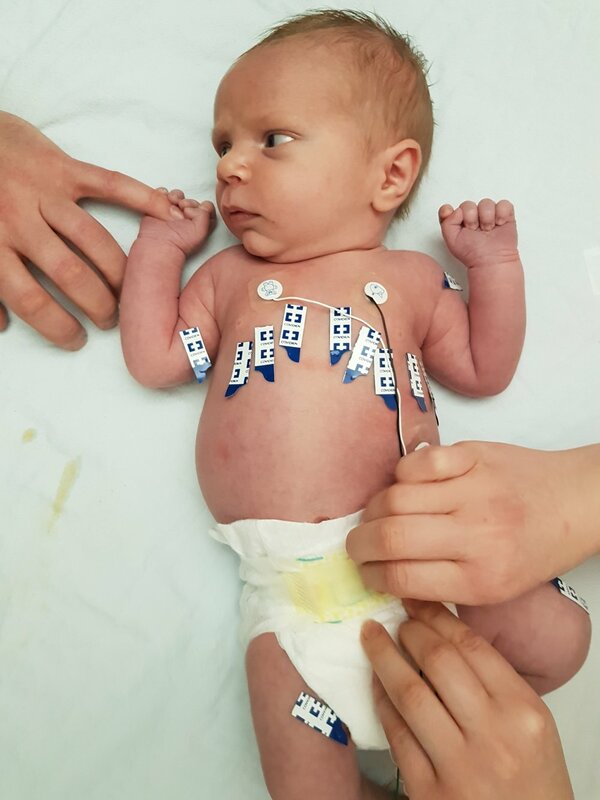 Due to his previous arrhythmia and fast heart rate anomaly, the obstetrician who monitored his heart during my pregnancy had requested heart monitoring from NICU post delivery. When the nurse practitioner arrived, she stated she couldn't hear the arrhythmia because his heart was beating so fast. Jack's heart rate was above 260 beats per minute. He was rushed to NICU and Dave went with him. Fortunately, his heart rate slowed down after 3 minutes to a normal level and stayed that way for 24 hours. We didn't have Jack with us our first night. He was in NICU away from us. I think that's why he's such a snuggle bum nowadays. Just shy of 2 weeks old, we received a heart monitor "holter" for Jack to wear for 24 hours. We initially thought he'd be wearing a vest as that's the term that kept being thrown around. But unfortunately, it wasn't a vest or a holter. It was multiple electrodes taped to his chest attached to a small monitor. I initially told Dave I didn't want to be anywhere near him and Jack when the electrodes and tape had to come off. Then I was sharing this story with a friend and fellow photographer and she reminded me what an opportunity this was to document for Jack. For us. For our futures selves. I'm so grateful I happened to connect with her before we took off the monitor, I would have regretted not capturing this time. Even if it's not sunshine and lollipops. Now we wait. We've done a lot of waiting to hear about Jack's heart and we will wait some more. He's a strong and brave boy and he's teaching his parents how to be strong and brave as well. We are learning that Jack is quite the adventurer. Whether that means an adventure we want to go on or not he's decided he's going to take some travels of his own. Last week we received a call from our cardiologist letting us know the results from his 24-hour monitoring were in. The doctor told us we needed to get down to sick kids within 1 to 2 hours. Dave was out for a short run and I was home alone with Jack. I let the wave of emotions wash over me, cried and called my mom because Dave was out. Then I went into Mama Bear mode and started packing everything but the kitchen sink for our 3 to 5 days stay at Sick Kids. Dave's 30 minute run felt like a marathon as I tried to keep myself busy by singing to Jack about our 'staycation' at Sick Kids and packing everything I could think of. Fortunately, as I've said before, Dave is a rock so once he got home he quickly showered and took control of the situation. We got packed up and headed down to Sick Kids to be admitted immediately. Upon arrival, we were greeted by a fellow who checked Jacks heart rate. Fortunately, he was showing the same symptoms that caused the cardiologist to send us to Sick Kids which allowed the fellow to catch it and track what was happening. Unfortunately, that meant his heart rate was at 298 beats per minute. As I've mentioned in previous posts, newborn's heart rates are typically 120 to 160 beats per minute. I had another little mini meltdown but was comforted by an amazing rhythmic cardiologist specialist who was overseeing Jack's care. This is the moment he was reading at 298 beats per minute. No physical signs to show us his heart is racing. We were initially told we'd be admitted within an hour but after seeing his heart rate at 298 we are admitted immediately. An incredible team of nurses and doctors managed to break Jack out of his high heart rate, and get him down to something manageable. He was put on an IV and monitoring devices and placed in a constant care unit. Over the next 4 days, we learned specifically what Jack heart disease is and how to manage it. It's known as SVT (Supraventricular Tachycardia) and it sounds worse than it is. He basically has a MIGHTY HEART that is super charged and can run into a race condition that spikes his heart rate. It's manageable but not curable. 1 in 3 grow out if it. Our next 6-12 months look like daily meds 3x a day and heart rate checks 3x a day with our fancy new stethoscope. We've nicknamed him Mighty Jack. Our time at Sick Kids is hard to describe. We were in a protective bubble with constant care, there was a nurse in our room at all times until the last night. We couldn't sleep in the same room as Jack until our last night. This was hard because since he was born (with the exception of his first night in NICU, he's been with us every night). Being in a room with other patients whose conditions were far worse than Jack's definitely put things into perspective and helped us manage our fears. The level of care the nurses, doctors, and staff have at Sick Kids is phenomenal. I truly can't describe how much their energy, calm demeanor and confidence put us at ease every day. These first few weeks have further strengthened my belief in the importance of documenting real and authentic moments of family life. I intentionally chose "Adventures in Unscripted Photography" as my photography tagline because life is unscripted. The reality of life is that it's not planned. Things can go "off-course" and that's what makes it so amazing and incredible. We now have real and authentic photographs that captured a sliver of the emotions we felt during our time at Sick Kids. These moments needed to be captured. Not just for me, but for Dave and for Jack. I want to thank everyone from all of us for the massive amount of support we've received. Every word, emoji, gif, image you've sent has lifted our hearts and made this process more manageable. I've told Jack just how many people have sent him love and support and he's super grateful. I also need to send a shout out to all the staff at 4D cardiology at Sick Kids. They kept Jack safe and us sane and well rested. We are truly so thankful and grateful for Jack's health care team.